In this text the Hasidic understanding of byn ha-arabim is defined. For Passover, the first arab is the last one-third of the 14th day (i.e., from the eighth until the 12th hour of daylight). The last arab of byn ha-arabim begins at sunset and consists of the first one-third of the night (including twilight as part of night), i.e., from the first until the fourth hour of night. The lamb is slaughtered within the arab ending the 14th day and is eaten during the arab at the beginning of the 15th day. This evidence also demonstrates that the early Hasidim began their legal day at sunset and had two periods of arab. The arab at the end of the day consisted of one-third of the daylight, i.e., from the eighth hour until the fulfilling of the 12th hour at sunset. Following sunset was the arab of the night, which began the 24-hour day. The arab of the night consisted of one-third of the night, i.e., the four hours following sunset, the first through fourth hours of the night. Notice that the moon shines from ἑσπέρας (hesperas; twilight = arab) until the dawn on the 15th day. Again, the festival is held for seven days to mark the precedence and honor which the number holds in the universe, indicating that nothing which tends to cheerfulness and public mirth and thankfulness to the deity should fail to be accompanied with memories of the sacred seven which he intended to be the source and fountain to men of all good things. TWO DAYS OUT OF THE SEVEN, THE FIRST AND THE LAST, ARE DECLARED SACRED. In this way he gave a natural precedence to the beginning and the end; but he also wished to create a harmony as on a musical instrument between the intermediates and the extremes. Perhaps too he wished to harmonize the festival with a past which adjoins the first day and a future which adjoins the last. But those supporting the Hasidic view, when translating the Hebrew thought into Greek, also used the term ἑσπέρας (hesperas) as a translation of their idea of the afternoon arab which ends the day. This interpretation must not be confused with the proper Greek usage of hespera (twilight after sunset and early dark) or the Aristocratic usage (twilight after sunset). In this above instance from Philo, when we come to the idea of בען הערבים, he takes the standard Pharisaic line for the two periods of arab. He therefore refers to each arab as a time of ἑσπέραν (twilight), and makes the first ἑσπέραν (twilight) occur at the ninth hour (about 3 P.M.). 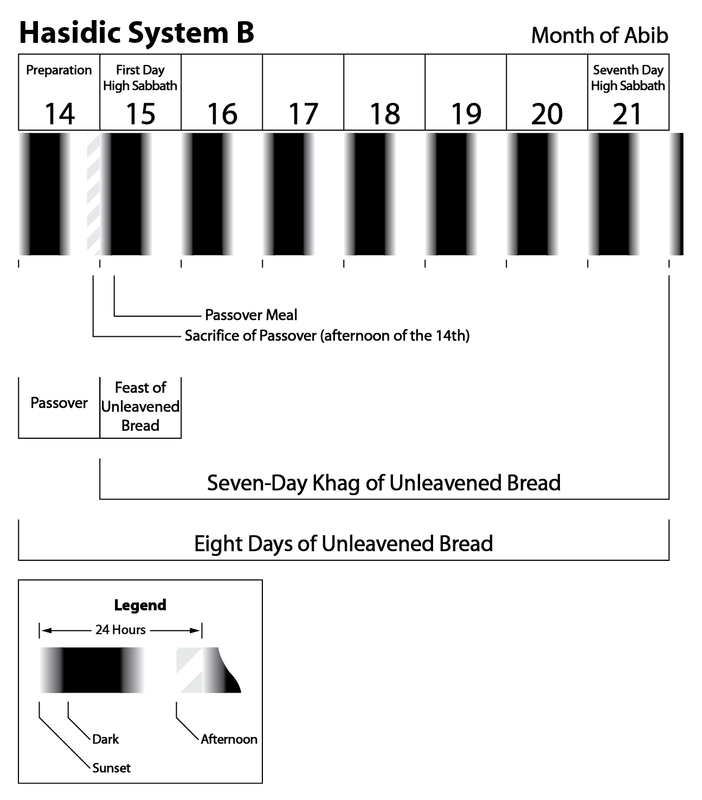 The heart of System B is the belief that the seven days of Unleavened Bread begin with the 15th of the first moon and last until the end of the 21st day. It is also obvious from this evidence that, for the adherents to the Hasidic view (System B), the expression ערבים (arabim) represents two periods of the day: the afternoon and the evening twilight, with mid-afternoon or sunset at the end of a day dividing the two. Another way of looking at this view is to make the early afternoon the first arab and the late afternoon, either ending at sunset (a legal day) or ending at dark (a common day), the second arab. Sacrificing the Passover lamb at about 3 P.M., accordingly, accommodates all three Hasidic understandings. Since the destruction of the Temple of Yahweh at Jerusalem by the Romans in 70 C.E., sacrifices required under the Torah of Moses, including the Passover sacrifice, have been dispensed with by the Jews. Yet, many of the Jewish faithful look forward to the reintroduction of these sacrifices when a future third Temple is built in Jerusalem. When these sacrifices are reinstituted, it is their belief that a Passover lamb should once again be sacrificed in the afternoon of the 14th of Abib and eaten during the night of the 15th. This concludes our discussion regarding the Hasidic practice of Passover and Unleavened Bread. 14. Passover – Aristocratic Practice I. 1 OTP 2, pp. 43–45. 2 Jub. 49:1f. This passage is taken from the Ethiopic text—the Latin is lacking at this point. 3 That the Ethiopic term used here is equivalent to byn ha-arabim see HBJ p. 172, n. 8. The Latin gives ad vesperam, which is used in the Vulgate to translate byn ha-arabim (cf., Vulg. at Exod. 12:6; Num., 9:3, 5, 11; Lev. 23:5). It is emended by R. H. Charles to read ad vesperas (HBJ p. 173, and n. 5). Also see below n. 36 regarding the parallel Greek term ἑσπέραν (hesperan; twilight). 5 Jub. 49:10f; Latin and Ethiopic in HBJ, pp. 172 and 173. 8 Philo Spec., 2:27 §145. 9 GEL 1968, p. 697. The Greek word ἑσπέρας (hesperas), “Lat. vespera, properly fem. of ἕσπερος . . . evening, eventide, eve” . . . ἕσπερος (hesperos), “of or at evening” . . . “esp. of the planet Venus . . . ἕσπ. θεός the god of darkness” (GEL p. 318; GEL, 1968, p. 697; NGEL, p. 579). Macrobius Saturn. 3:14f, “vespera follows” sunset. For the Greeks, ἑσπέρας (hesperas) properly represents the period from sunset until the first hour of darkness at night. It is the time of Venus as the evening star as opposed to Venus as the morning star (e.g., see Aristotle EN 5:1:15; Homer Iliad 22:317f; cf., Horace Odes 2:9:10f). James Donnegan’s lexicon defines it this way, “Hesperus, (the planet Venus) when it sets after the sun; Lucifer, Φωσϕόρος, when it rises before” (NGEL p. 579). Leonard Whibley notes that the period of ἑσπέρα (hespera) was part of the period associated with darkness as opposed to those Greek terms associated with daylight (CGS p. 589, §626). To demonstrate further, the Greek writers make the evening star appear at the time of “ϕθιμενοις (phthi-menois; waning)” of the day (Gk. Anth. 670). Oppian defines this period of hespera when he writes, “ἑσπερίῃσιν ὅτ’ ηέλιος ζυγα κλίνει (hesperiesin ot helios zuga klinei; the time of hespera, at which time the sun’s team laid down), when herdsmen command their herds what time they travel homeward to their folds, heavy of breast and swollen of udder” (Oppian Cyneg. 1:138ff). The Greek idea was that the team that pulled the sun chariot across the sky during the day laid down to rest after the sun had been pulled beneath the horizon. According to Pliny, the day among all “the common people everywhere” extended “a luce ad tenebras (from dawn until the dark of night)” (Pliny 2:79). Therefore, the evening star appeared during the waning part of the day (after sunset). Other markers demonstrating the Greek concept of the time of hesperas are as follows: In Acts, 4:3, this period is placed in context when we read that Keph (Peter) was placed in a holding cell “until the αὔριον (aurion; morning breeze; SEC, Gk. #839), for it was already ἑσπέρα (hespera),” in order that he might be brought before the rulers and elders at Jerusalem. Accordingly, he was placed in a holding cell after the government’s daily business hours. Homer, meanwhile, speaks of how some people “waited until hesperon should come; and as they made merry dark hesperos came upon them. Then they went, each man to his house” (Homer Ody., 1:422f). This statement clearly connects the time of hesperon with the darkening of light after sunset. In another place Homer writes that some people were to “gather at hesperious beside the swift ship,” and then subsequent to that event notes, “Now the sun set and all the ways grew dark. Then she (the goddess) drew the swift ship to the sea” (Homer Ody., 2:385–389). Therefore, the people gathered at twilight and only after it became dark did the ship set sail. Homer also notes that a man visited his fields and herdsmen and then afterward, when hesperios arrived, returned to the city (Homer Ody. 15:503–505). Homer also writes that it was at the time of hesperios that the ram longs to return to the fold (Homer Ody. 9:447–452). As any sheep rancher will advise, this occurs with sunset. He also reports the words of a man advising a stranger that, “The day is far spent, and soon you will find it colder ποτἰ (poti; toward) ἑσπερα (hespera)” (Homer Ody. 17:190f). In another place Homer reports that certain people “took supper, and waited until hesperon should come” (Homer Ody. 4:785f). Men generally worked in the fields until the 11th hour (e.g., Matt. 20:1-13), after which they would return home to supper (cf., Ruth, 3:7). It would be fair to conclude that this also was the hour for supper among the Greeks. It is true that supper among the priests and upper class Jews was a little earlier, coming late in the afternoon, at various times between the ninth until the twelfth hours (EWJ pp. 44f). Yet this principle was in part guided by the fact that the ninth hour (3 P.M.) was the hour of prayer (Jos. Antiq. 14:4:2; Acts 3:1). Josephus notes that the Essenes had breakfast in the fifth hour (11 A.M.) and then returned to their labors until δείλης (deiles; afternoon), at which time they would have supper (Jos. Wars, 2:8:5). In either case, the supper mentioned in the Greek story took place at some point prior to the arrival of the hour of hespera. This detail places the Greek time for hespera later in the day than the Hasidic concept of an afternoon arab, despite the fact that the Hasidic writers used hesperon to identify an earlier period of arab. Hespera, therefore, is a reference to the time of a day connected with darkness, after supper, and when the Hesperus star appears, that is, the period of twilight after sunset. 10 Philo Spec., 2:28 §155. 11 Notice that Philo can only offer guesses as to why unleavened bread was used. The Jews were puzzled by this question. It was answered by the messiah and the disciples, who noted the unleavened bread represented the messiah’s body, truth, and sincerity (1 Cor. 5:8, 11:23-24; Luke 22:19; Matt. 26:26; Mark 14:22); that is, unleavened bread represents the sinlessness of the messiah. 12 Philo Spec., 2:28 §156f. 13 Philo Spec., 2:28 §150. 14 BE p. 90, n. 6; also cited in Colson, Philo, vii, p. 627. 15 See Marcus, Philo, Sup. II, p. 20, n. d. The term πρὸς (pros), when used with ἑσπέραν (hesperan) means “at” or “on the side of” the time of hesperan (GEL, 1968, pp. 697, 1496f). More exactly, this phrase refers to the beginning time of hesperan (= arab). The Greek phrase πρὸς ἑσπέραν (pros hesperan) is used in the LXX as the equivalent of the Hebrew לעת ערב (la-ath arab; at the time of arab), cf., LXX at Gen. 8:11; 2 Kings (MT 2 Sam.) 11:2; Isa. 17:14; and the Hebrew בען הערבים (byn ha-arabim), cf., LXX at Exod. 12:6, 16:12; Num. 9:3, 11, 28:4, 8. 16 Philo, Exod., 1:11. J. B. Aucher renders this last line literally, “tempus mediocre ad vesperam vergens (the time between inclining toward vesperam)” (Marcus, Philo, Sup. II, p. 20, ns. d & h.). 17 See the LXX at Exod. 12:6, 16:12; Lev. 23:5; Num. 9:3. Interestingly, both the supporters of the Hasidic view and the Aristocratic view could look at the same words used in the LXX and come to entirely opposite understandings of what the word pros hesperan meant. For those of the Aristocratic school it meant twilight after sunset, while those of the Hasidic school interpreted it to mean the afternoon arab. 18 The Latin term vespere (vesparum; etc. ), which has essentially the same meaning as the Greek term ἑσπέραν (hesperan), was also used by the supporters of System B for the mid-afternoon arab. Also see above ns. 30 & 36. 19 Colson Philo, vii, p. 627; BE, p. 90, n. 6. 22 Jos. Wars, 6:9:3f §423ff. 30 The Gemara points out that there is a lacuna here in the Mishnah. In its place, the Gemara claims, it should state that the prohibition against leavened bread during the Passover of Egypt “lasted but one day,” and then the text continues as above (Gem. 96b). This entry was posted on 01/18/2013, 2:41 pm and is filed under Calendar, Feast Days, Holy Days, Jews, Passover, Religion, Unleavened Bread, Yahshua, Yahushua, Yahweh. You can follow any responses to this entry through RSS 2.0. You can leave a response, or trackback from your own site. Looking forward to the proofs for the Aristocratic system as Passover and Unleavened Bread are coming up next. I’d like to be sure I am observing it the way Yahweh instructed us. I’m disappointed that there aren’t more postings. I think Yahweh’s sacred days would excite more people to comment. When I first studied close to 20 years ago how to do the Passover, it really was exciting. Although it’s still exciting even just reviewing it again. It does help once you get into the Scriptures of knowing how those different groups did it.